The bartender asks the guy sitting at the bar, "What'll you have?" The guy answers, "A scotch, please." 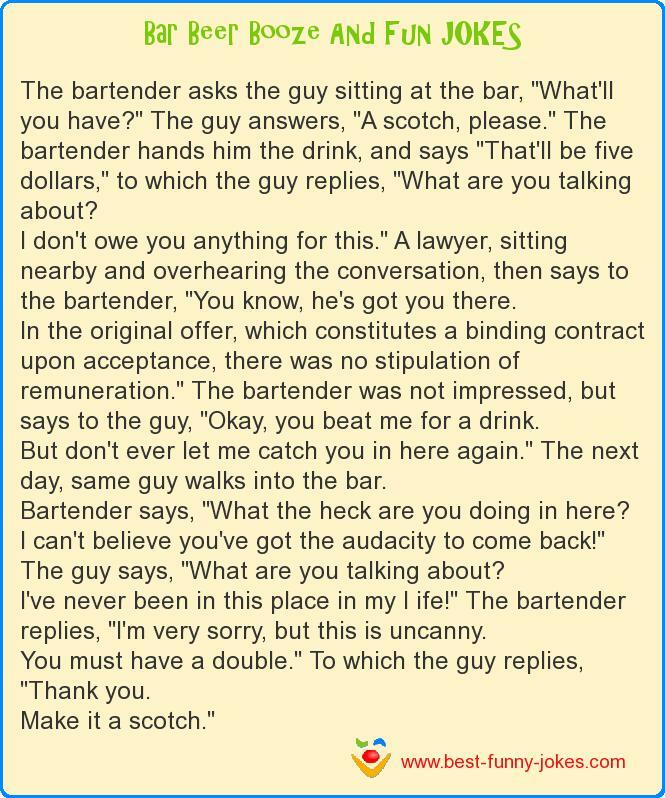 The bartender hands him the drink, and says "That'll be five dollars," to which the guy replies, "What are you talking about? I don't owe you anything for this." A lawyer, sitting nearby and overhearing the conversation, then says to the bartender, "You know, he's got you there. In the original offer, which constitutes a binding contract upon acceptance, there was no stipulation of remuneration." The bartender was not impressed, but says to the guy, "Okay, you beat me for a drink. But don't ever let me catch you in here again." The next day, same guy walks into the bar. Bartender says, "What the heck are you doing in here? I can't believe you've got the audacity to come back!" The guy says, "What are you talking about? I've never been in this place in my l ife!" The bartender replies, "I'm very sorry, but this is uncanny. You must have a double." To which the guy replies, "Thank you.